All proceeds will go to the Red Cross. 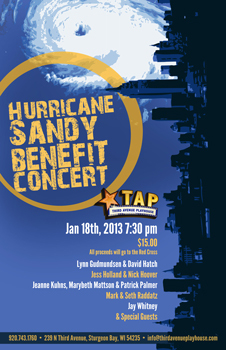 To purchase tickets using a credit card over the phone call the Box Office at 920-743-1760. 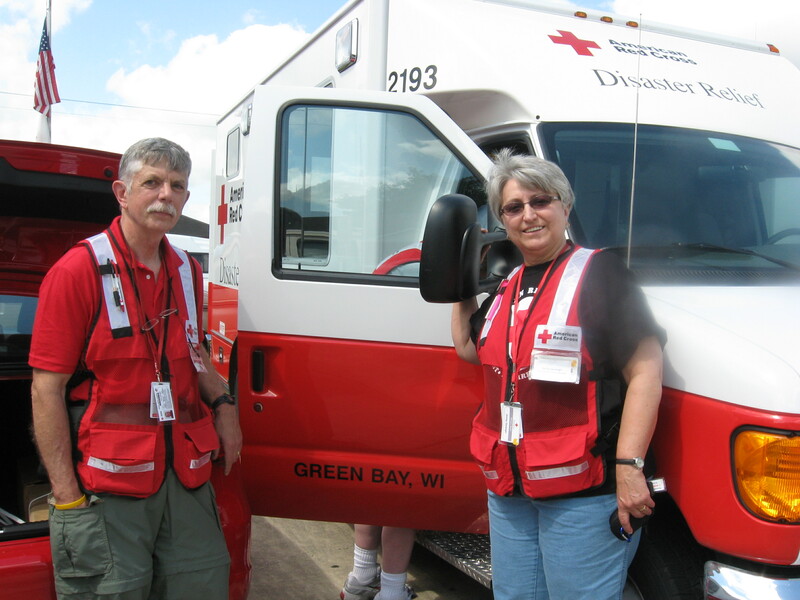 Rudy Senarighi and his wife Shirley volunteer for the Red Cross during national disasters. Rudy is helping the Red Cross’s mental health team with Hurricane Sandy disaster relief. At some point in your life, you decide if you’re going to just take up space or do something good for the world. Rudy Senarighi chose to do something good. On the morning of Wednesday, Oct. 31, he hopped on a plane to New Jersey to volunteer with the Red Cross Hurricane Sandy disaster relief efforts.Senarighi, of Sturgeon Bay, helps with the Red Cross’s mental health team. He’s a retired guidance counselor who worked at Walker Middle School for 25 years, and when the Red Cross sent out a call for volunteers in the mental health field, he signed up. “I’m retired now, and I have the time,” said Senarighi. “I want to give back. Senarighi’s volunteered at nine natural disasters, including hurricanes Katrina and Rita and the tornados in Joplin, Missouri. He’s also helped out with local disasters like fires. He’s not sure what he’ll be assigned to do in New Jersey – it depends on what needs to be done. In the past he’s helped support victims and other volunteers, and helped connect people in need with available resources. For the next three weeks, Senarighi will be helping to bring normalcy back to a disaster zone. He does it because he knows he can help, and he wants to give his time and energy to people that could really use it. “We know they’re going to be there for us when we need them, so we’re going to be there for them,” Senarighi said. Just as Rudy and Shirley Senarighi, of Sturgeon Bay, sit down to enjoy dinner, the phone rings. Shirley gets up to answer it. The couple has been volunteering for the American Red Cross for several years and Rudy knows by Shirley’s end of the conversation that the American Red Cross needs their assistance. As volunteers, the couple responds locally to help with area disasters and they have also been on several national deployments assisting in a Disaster Mental Health capacity. Between them, the couple has over 60 years of professional experience as counselors, teachers and administrative supervisors. They also bring experience in school district disaster planning and the Door County Critical Incident Stress Management Program to their volunteer roles. The couple supports the American Red Cross in whatever way they are most needed locally and nationally. On national deployment volunteers are placed in roles to best utilize their skills for a particular disaster, as there are many needs during the crises the American Red Cross responds to. The assignments are varied but the couple is always positioned in Disaster Mental Health roles so they can help the American Red Cross ensure that the immediate mental health needs are attended to along with the physical immediate needs. What was once unimaginable is now reality: homes destroyed, livelihoods lost, loved ones missing or gone. Workers from the American Red Cross know that people not only need supplies to keep up their physical well-being, such as food and water, but they also need emotional support. The last deployment for Rudy and Shirley was to the hard hit are of Joplin, MO after a devastating F5 tornado ripped through the town on May 22, 2011 causing 116 deaths. Rudy and Shirly both served there for many weeks. Rudy, a cancer survivor for 11 years, believes his experience helps him bring focus to the really important things in life as he interacts with disaster survivors. Rudy performed outreach in the community, helped at aid stations in various neighborhoods hit by the tornado, as well as provided support at a client shelter. He checked on individuals as to their need for resources, plans for reintegrating into their community and triaged their mental health needs. Shirley was the mental health lead for the Integrated Care Teams (ICT). She worked with the health lead to assemble and train ten teams of four volunteers per team – client casework, health, mental health, and spiritual care. The ICT teams contacted and met with families of those who had died as a result of the tornado. These teams contacted well over one hundred families within the first two weeks of the operation. “The most difficult part is leaving the disaster operation while seeing so much work yet to do and not being able to finish things started,” says Rudy. The couple is proud to serve the American Red Cross both locally and nationally to help communities with that start. It’s important, “being there to listen to the individual stories and then helping people sort through their options to begin to make steps forward,” says Rudy. So when that phone call comes in the middle of a frigid, Wisconsin night or as the plates are just hitting the dinner table, “We look at one another briefly and then say, ‘yes, we’ll go.’ We know others would be there if we needed help,” says Shirley. Nikki Pease's fifth-grade class present Diane Knutson, far left, a disaster volunteer for the Lakeland Chapter of the American Red Cross, with blankets that they made as part of Sunrise Serves the Community service project. The student service learning group at Sunrise Elementary School ended the academic year on a warm and fuzzy note with the donation of 27 fleece blankets and 15 fleece pillows to HELP of Door County and the local Red Cross. The Sunrise Serves the Community student group works with guidance counselor Belinda Richard during the school year learning about leadership and working on service projects that benefit the community. The student consensus early on was that they wanted to learn about homelessness, Richard said. The group contacted local organizations to learn all they could about subject. Christine Salmon, then from the United Way of Door County; Joanne Ator, the county’s Economic Support supervisor; Judy Gregory from the Lakeland Chapter of the American Red Cross; and HELP of Door County youth advocate Jessica Holland all came to talk with the students. From there, students brainstormed about how they could use what they learned to help others and what they would miss most if they lost their homes, Richard said. The students decided that kids their age would want something to snuggle or something comfy. “We decided we should make blankets for homeless children in our area,” student Allison Bridenhagen said. Allison was a fifth-grader at the time. To raise money for the material, Sunrise Serves the Community hosted an after-school fun event to raise money for the fleece and the school’s Destination ImagiNation team, Richard said. Walmart donated $50, several staff members donated fabric and Elementary Principal Ann Smejkal also chipped in more than $25 for the project. The service group also created a short DVD presentation of what they learned from their research and what they would like each third-, fourth- and fifth-grade class in the school to do to help them meet their goal of 12 blankets. Each class was asked to make one blanket. The group’s goal was exceeded when one class made an additional 10 blankets that they requested be sent to the tornado ravaged Joplin, Mo. Seeing the entire school get involved with the project “was amazing,” Allison said. The students also held a bake sale for Japan earthquake relief and raised about $300 that they donated to the Red Cross. 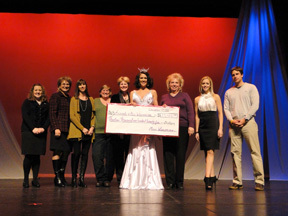 Miss Wisconsin, Kim Sawyer, presents a ceremonial check for $13,125 to Door County charities at Saturday night’s Miss Wisconsin and Friends celebration at the Door Community Auditorium. Photo by Zachary Kunstman. The American Red Cross Lakeland Chapter Transportation Service in Door County will be discontinued as of January 1, 2011. This service began in Door County in 2002. Since its beginning, our mission has been to meet the transportation needs of elderly and individuals with disabilities by providing safe, reliable and affordable transportation. The past two years has been very challenging as we have continued to operate our service in Door County. During this time, the overall transportation environment has changed which has impacted our service. There are now other transportation options available to Door County residents that can meet the needs going forward. Please note that this announcement impacts only our Transportation Service in Door County. We will continue to provide Disaster Services, Services to Armed Forces and Health and Safety training. Fire broke out at the home of Bill and Sarah Anschutz at 5594 Daubner Lane north of Carlsville about 11 a.m. Wednesday, leaving a gaping hole in their roof and exposing the side of their house as temperatures outside continued to plummet. Bill Anschutz said he worried what damage may come to the home if heat could not be restored because the home’s primary heat source was hot water heat fueled entirely by a woodburner in the basement. By Wednesday afternoon, PortSide Builders was on the scene taking measurements to help secure the home and a backup gas boiler in the basement was being readied as an alternate fuel. An electrician had also been called to check wiring and Wisconsin Public Service also was called to restore power to the home. Anschutz said he was outside the couple’s rural wooded home when his wife came out to tell him she could see smoke and called the fire department. Flames were already coming from the chimney and heavy smoke from the roof with fire in the attic, Egg Harbor Fire Chief Steve Schopf said, when the Egg Harbor fire department arrived along with mutual aid from fire departments in Baileys Harbor, Ephraim, Gibraltar, Jacksonport, Sister Bay/Liberty Grove and Sturgeon Bay. Schopf estimated the damage to be moderate and said the cause was a faulty chimney flue used by the woodburner. The home had three chimneys, he said, but only one masonry chimney was being used by the woodburner at the time of the fire. There was no visible build up when the flue was taken down, he said, but there was no way to know if it was cleared or cracked previous to the fire. Both that flue, the chimney and much of the sidewall next to the fireplace was completely cut away by firefighters to contain the fire near the fireplace in the living room, he said. The fireplace was not being used at the time of the fire. The two-stall attached garage appeared normal and the family was able to stand in the right side of the home Wednesday afternoon while firefighters were still at the scene pulling insulation and tamping out what remained of an almost barren backside of the living room wall on the left side of the house. Heavy smoke and water damage, he said, made the home unlivable but the family had insurance and opted to stay at a hotel. Red Cross assistance was available for both the family and emergency workers with two Door County volunteers providing water, Gatorade and lunch for about 50 emergency personnel. The Door County Sheriff’s Department directed traffic nearby on Wisconsin 42 and Emergency Medical Services also responded to the call. The fire department cleared the scene at 2:37 p.m.